DUANE PROKOP/LAS VEGAS REVIEW-JOURNAL Eldorado guard Mitrell Clark has averaged 23.8 points to help the Sundevils to a 12-4 start. Effortlessly knocking down long jumper after long jumper, Eldorado’s Mitrell Clark makes it look as if the skill comes naturally to him. But it’s not natural ability that makes the senior guard such a deadly shooter, Sundevils coach Michael Uzan said. That love of the game has helped Clark hone his skills to become one of the area’s top scoring threats. He averages 23.8 points for Eldorado, which improved to 12-4 with a 73-69 win over Rancho on Tuesday night. The Sundevils are tied with Desert Pines atop the Northeast League at 2-0. Clark averaged 15.3 points last year for Eldorado but has picked up his production this season. Last season, Clark spent most of his time at shooting guard with Mike Elliott running the point. 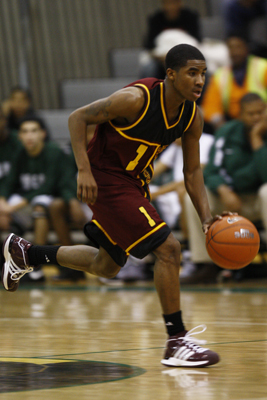 But this season, Clark has emerged as the team’s primary point guard, a role he enjoys. That’s helped Clark average 4.6 assists as he uses his ability to penetrate to get shots for himself or teammates. Uzan said Clark has adapted well to the new role of playing the point full time and also has adjusted to the variety of gimmick defenses he faces. Clark’s early-season success also has translated to early victories for an inexperienced Eldorado team. Only Clark, Marcus Moreland and Charles White played significant minutes last season. Uzan said Clark’s leadership has helped the younger players. Clark said the team has come together quickly and team chemistry is good this season. “Right now we’re still in that stage where we have to develop, but we’re getting there pretty fast this year,” Clark said. Uzan said White and Moreland have helped take pressure off Clark and forced teams to play more honest defense. Uzan said the 5-foot-10-inch Clark is starting to get the attention of some colleges, and the coach thinks his star can excel at the college level. No matter where Clark ends up next season, Uzan said his presence will be missed at Eldorado.